What a brisk, sunny, buzzingly beautiful day. The streets were alive with conversation, local couples stolling slowly, merchants looking happy...there was a big smile in the air. My neighborhood feels more intimate than usual. One of the things that I enjoy about Florence is how its personality constantly changes with the seasons. Right now it feels cozy and happy and very non-touristy. I like it this way. Locals are out Christmas shopping, arm-in-arm, gazing in boutique windows, taking a caffè and just enjoying the Christmas ambience that is all around the city today. We're all wearing scarves, hats and boots, but the cold doesn't seem so cold when the sun is shining and the smell of roasted chestnuts fills the fresh air! While absorbing this energizing spirit in the air, I was on my way to exchange some films at the library, when it occured to me that right now would be the perfect time to visit the museum "Firenze com'Era" which I've been wanting to see. I pass by it all the time, but never went in. I am waiting for just the right time to finally absorb each museum here in Florence, but have been wanting to do it spontaneously. The museum was open and empty, so I had the museum curators all to myself, and after answering some of my questions, they ended up taking me on a private tour. This museum is particularly interesting to me because it demonstrates what Florence looked like as it evolved from Roman times, through Medieval times, to the Renaissance, to the present. It houses a striking collection of city maps, paintings, photographs and a model of what the city looked like in Roman times. 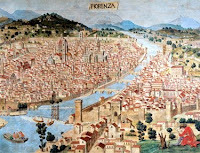 I was particularly struck at the old 1472 painting of Florence which shows the infrastructure of the city as it existed 600 years ago. It's amazing to be able to see all of the main piazzas and monuments as they existed then, and to even be able to see my street and building and what it looked like back then, when the city walls and towers still existed. The city, before motorized traffic was much cleaner then, the Arno looked more blue, and the homes more quaint. The rest of the museum shows roadmaps and city plans developed by Giovanni Poggi after the Risorgimento. I feel richer and more attatched to my city after having observed a bit more of its history and how the infrastructure evolved over the centuries. I feel more like it really is mine. Then I went to the library to exchange some books and films. 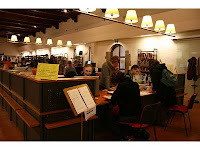 This library is open until midnight. The terrace on the top floor has a stunning view of the duomo and has a caffeteria/bar where you can sip a hot chocolate or have an aperitivo in the evening while listening to a jazz trio. As I was browsing through some films, a presentation was just begining in the adjacent room which I stayed to watch. Then I borrowed some Italian films and books, and went out on the terrace where I did some reading with the very inspirational panorama of the Duomo in the background.